If you want to look cool in a minivan you, well, can’t. The minivan was never made for the racking up of cool points, but rather for sensibility scores. You trade in your sedan, sports car or truck for the minivan because your family is growing and a minivan makes some of the best choices for having a vehicle that will carry your family where it needs to go with the size, versatility and features your need. Because of the overall look of a minivan, many have gone by the wayside in favor of SUVs for many makers, but minivans still have a place in the automobile market. 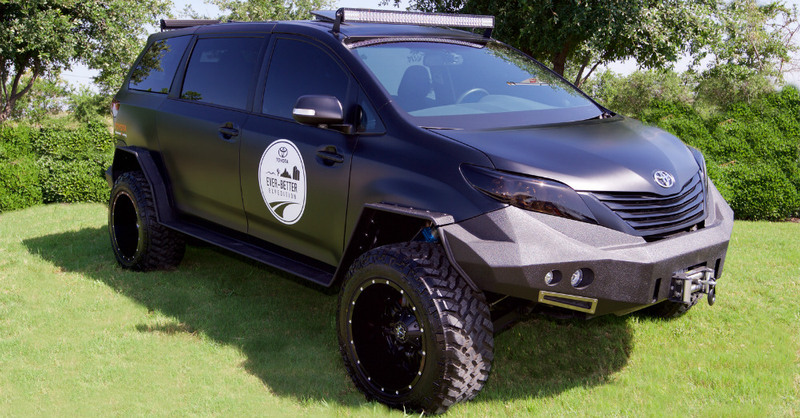 Toyota has actually created a minivan that you can now look cool driving and will show it off at SEMA in the fall. This new Toyota Ultimate Utility Vehicle (UUV) is a blend of two top sellers to create a beastly beauty of a vehicle. The blend is actually the taking of a Tacoma and Sienna and melding them together to give a minivan that is seriously aggressive and able to handle off road needs of a family that will be ready to head outdoors for camping or just some great weekend off road trips. The chassis of the new UUV has been lifted to be able to accommodate the big, knobby tires that are featured on this vehicle. The front shows off with a military grade front bumper that features a heavy duty winch, auxiliary lights and smoked headlights. Painted in matte black the new UUV is mean and angry looking to make it a lot of fun to drive around in a vehicle that has its own monster attitude. This particular vehicle was built for the Toyota’s Ever-Better Expedition across North America where it will travel more than 16,500 miles of the United States and Canada. This will certainly test this big beast of a vehicle as it finds its way across the continent on this track. You might wonder why Toyota made this UUV when they have a menu of great SUVs to take the trek and do what need done and the only answer found is simply because they can. Most of us who might want to see the UUV up close will have to wait until SEMA in the fall because the terrain this vehicle will be riding on will certainly be difficult to get to, but this UUV certainly shows us a minivan that gains a huge amount of cool points for anyone behind the wheel. ← Previous Previous post: What Fuel Mileage are You Looking For in a Chevy?